The convention date is fast approaching and we've just received these updates. 14:00 opening with a minute's silence for Johnny Hutchinson, David Bedford will talk about him and then The Strawberries play the song "Some other guy". 14:30 group photo, on time! Every guest and participant can participate. 4 pm you can buy your ordered photo! Afterwards discussion with David Bedford, led by Boris Roßner, then draw the ticket number and afterwards signing and personal talk time. At the same time you can watch the special exhibition for the 80th birthday of Jimmy Nicol. On May 12, 2019 there will be plenty of excitement in Eger, Hungary! 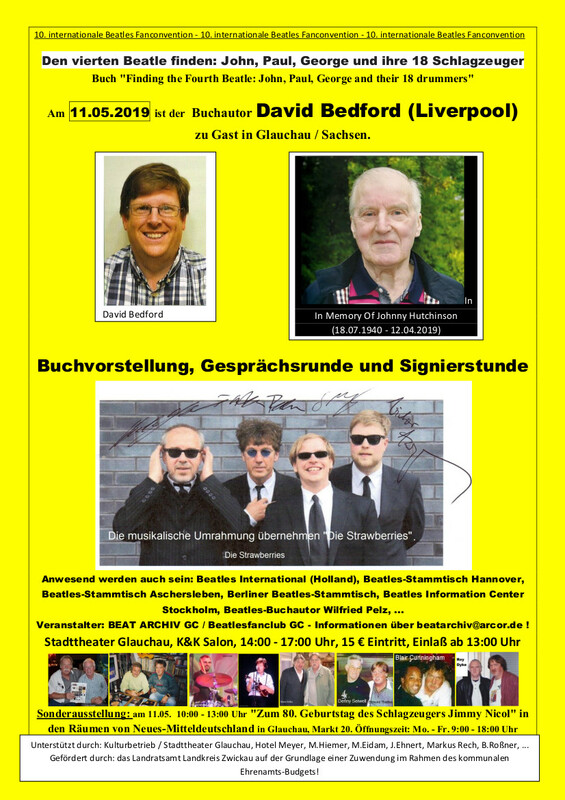 To celebrate the Egri Road Beatle Museum's 4th birthday, there will be an international conference with Ukrainian and Polish guests for the whole weekend. Also attending the event are The Quarrymen all the way from Liverpool who will perform and tell stories on Sunday May 12. Read more about what is planned here and if you attend, tell them at the museum that you heard about it from the BBFC! Last chance to see this wonderful show - Two-4-One Offer! 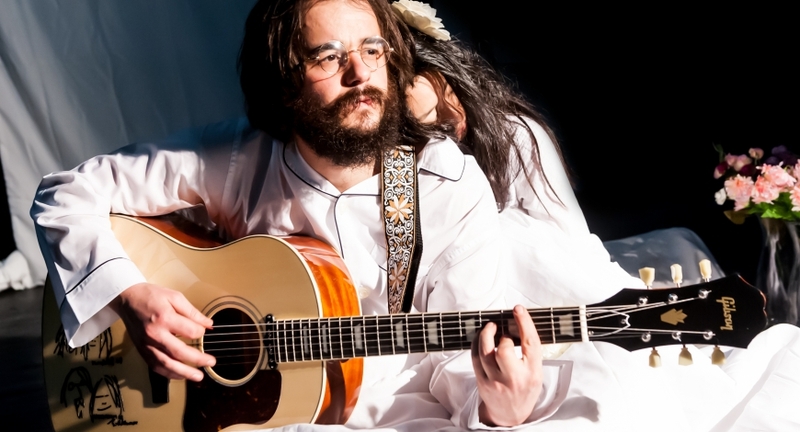 There are less than two weeks left to come and see BED PEACE - The play with music that marks 50 years since the famous Lennon / Ono Bed-In. Last show April 28th. Performed in the round, this new piece of theatre explores the politics, the personal journeys, and the music. Come along and Give Peace A Chance. The BBFC have attended and we highly recommend it. Wonderful intimate theatre makes the audience part of the show! 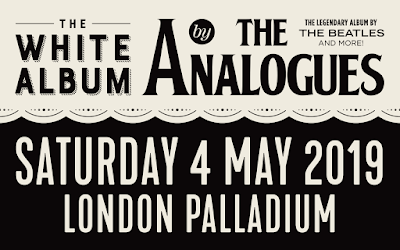 On May 4th at London’s Palladium, The Analogues will bring to life one of music’s most cherished and expansive LPs, The White Album – playing the 30-track record in its entirety, from the very first to very last note. It takes a special kind of obsessive to perfectly recreate on stage an album never made to be performed live. But The Analogues are no ordinary Beatles fans. They are the type to instigate a viral campaign to help locate the exact bell sound from “Everybody's Got Something To Hide Except For Me And My Money", listening to every submission on the phone (they eventually found it in a Maritime store) – or spend months trying to track down a real harpsichord, even if it only appears on one Beatles track (“Piggies”). 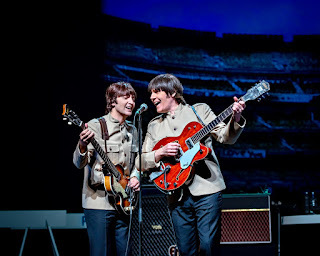 The Beatles stopped performing in 1966, fed up of the constant hysteria at their shows that began to inhibit rather than propel the band forward. This decision meant albums such as 1968’s The White Album were driven by studio experimentation and, while they changed music, fans were never able to experience the records live. Indeed, many thought it could not be done. To many, The White Album is The Beatles’ magnum opus. 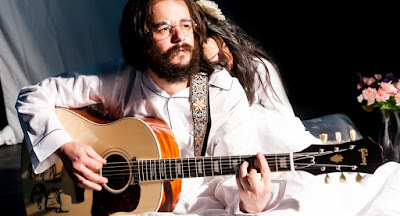 It’s a quirky masterpiece that in all its diversity, when performed live, requires the utmost from both musicians and production. It’s a project that requires a near obsessive level of attention to detail, one that has taken The Analogues an eternity of preparation, research and practice. “As someone once said "if you want to see a Beatle go to McCartney - if you want to hear The Beatles go to The Analogues", says Fred. Not something we would dare to suggest ourselves but deep down that is our mission. Ignore the visual impact of wigs and costumes and focus completely on the sound." 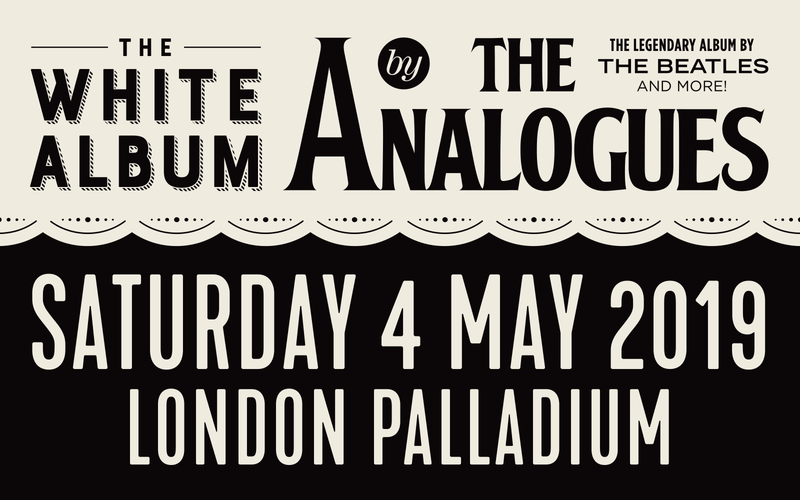 The Analogues are a five-piece group of Dutch musicians who have been lauded over the past few years for their integral live adaptations of Beatles albums. They all share a deep-rooted passion for The Beatles, and especially the iconic post-1966 'studio albums'. 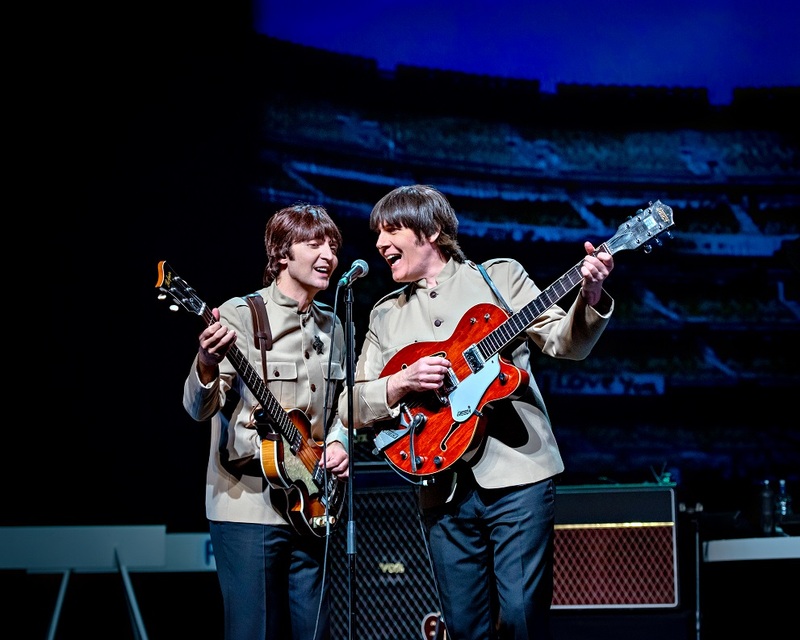 Does the world need another Beatles tribute band? Probably not if it’s all about wigs, suits, ‘yeah yeah yeahs’ and the earlier part of the Fab Four’s repertoire. The Analogues, on the other hand, focus on The Beatles’ later work. We’re talking about the songs forged in the studio when the band’s creativity blossomed into outright genius. The Beatles themselves never toured with this material - however The Analogues do. So far, the band have travelled across the globe performing Sgt. Pepper's Lonely Hearts Club Band, Magical Mystery Tour, The White Album and soon, Abbey Road - each album in its entirety, from start to finish. They bring this magical music to life accompanied by an eight-piece string and horn section, all performing with original period instruments, with a passion for perfection and an unrelenting eye for even the smallest detail. More information on their impressive ‘travelling museum’ can be found here - http://www.theanalogues.net/instruments. Bart van Poppel - Musical director. Walrus. Sloppy execution can induce grumpiness. Wears sandals to the office. Bass, keys, vocals. Jac Bico - Silent Force. Makes anything weep gently, as long as it has strings. Prefers playing over talking. Guitars, bass, sitar, percussion, recorder, keys, vocals. Fred Gehring - Seriously annoyed by dwindling awareness of the Beatles songbook; chairman of the (future) Beatles Preservation Society. Drums, vocals. Diederik Nomden - Born many years after The White Album was released. Likes to trump Bart as main nitpicker on barely audible subtleties. Keys, guitar, vocals. Felix Maginn - Finally, a native speaker of English. Replaces the irreplaceable. Part-time crooner. Amazing equestrian skills. Guitar, vocals. Jan van der Meij - Irreplaceable as ‘loud McCartney’. Temporarily unavailable due to 40 years of faithful service in front of a guitar amp. Guitars, vocals.